An official website of the Chester County Government. A conservation easement is a voluntary contract that permanently limits the type and intensity of future land use while allowing a landowner to retain control of his or her property. Such easements typically take the form of a deed restriction. Such easements typically involve a land trust or conservancy. When a land trust acquires an "easement" on a property, it does not purchase the property from its owner. Instead, the trust makes a contract with the landowner, which allows the trust to have exclusive use of the land for a specific purpose. Put another way, the trust removes from the owner some of the rights to use the property. For example, Mr. and Mrs. Brown own a wood lot that they want to protect, and so they donate a forest conservation easement to the ACME Land Trust. Mr. and Mrs. Brown still own the land, but they have given up the right to cut down the trees. When the ACME Land Trust acquires the easement, they acquire a "property right" previously owned by Mr. and Mrs. Brown. Beginning in the 1940s, Chester County landowners established some of the nation's first non-profit land trusts. These land trusts are organizations whose purpose is to protect open space from development by either acquiring land in-fee or by protecting it with a conservation easement. Because of these open space pioneers, the County now has over a dozen land trusts which together have protected open space on nearly 120,000 acres of property within the County. These organizations may be called "conservancies" or "trusts" but they all function in a similar way. Some of these land trusts, such as the Nature Conservancy, protect lands throughout the world, while others, like the Pennsbury Land Trust, focus on a single municipality. Other land trusts only acquire open space properties or conservation easements for a short period, and then sell or transfer them to another land trust or a state agency. In recent years most conservation easements have been funded through state or county grants which require a cash match from local municipal governments. When a landowner sells or donates a conservation easement, the landowner still retains the majority of the rights to the land. The landowner is still responsible for maintaining the property, just like any other private property owner. There is no expenditure of public funds to maintain the property in perpetuity, which over the long term can be substantial. An ongoing obstacle to conserving open space though conservation easements is the need for large amounts of funding, as is inherent in any real estate initiative. Furthermore, the great majority of eased parcels are on private property and like all private properties they are not open to the general public. Anyone who wishes to enter a private property with a conservation easement must first get permission from the landowner. As a result, each community should consider whether it is appropriate to use public funds to protect lands that will not have public access. A compromise is to establish trail easements around eased lands. Conservation easements are typically implemented through a partnership of a land trust and a municipal government in which the primary government role is to conduct planning that will create an environment where a trust can protect the land through easements. By addressing open space protection in a comprehensive plan or through an adopted official map, municipal governments can create a "paper trail" documenting that they have a well considered and publicly reviewed plan, which will greatly improve the likelihood that their open space protection projects will receive comparative state or county grants. Municipalities can also help to establish a local land trust that is active within just their municipality. These local land trusts are non-government entities that can receive municipal grants. This approach can be effective, but is also labor intensive and so is not right for all communities. Open Space Planning: A Guide for Municipalities, Chester County Planning Commission, 2005. GreenSpace Alliance and DVRPC: The Economic Value of Protected Open Space in Southeastern Pennsylvania - Report Summary, DVRPC, 2010. 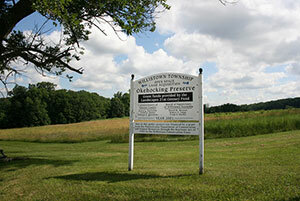 Opportunity Knocks: Open Space as a Community Investment, 2000, The Heritage Conservancy. Conservation: An Investment That Pays, 2009. The Trust for Public Land.